Cool, creamy avocado. Delicious, nutritious salmon. Spicy Tabasco. Perfect meal for enjoying out on the deck! Mmm…avocados! You all know by now how much I LOVE avocados! 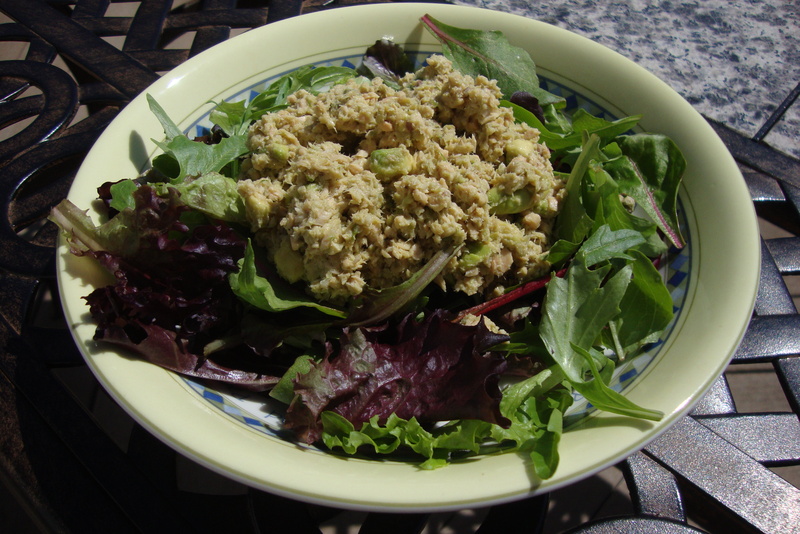 I know I just posted a very similar recipe for Tuna and Avocado Salad not long ago. This is a very simple variation on that same meal! Sub out the tuna and lemon for salmon and lime, add a couple of dashes of Tabasco, and DELICIOUS! Combine all of the above ingredients in a bowl. Using a spoon or fork, gently break up the salmon into little pieces. The avocado will mash slightly, but you will still have some larger chunks dispersed throughout the salad. Check for seasoning – I used 2 pinches of sea salt and 3 grinds of pepper and it was perfect for our taste! Throw the salad on top of mixed baby or eat it straight out of the bowl! Scrumptious! Avocado, Lime, Onions, Salmon, Tabasco sauce. Bookmark. Ooo…that sounds good too! I’ll have to try that next time!